Update: These instructions work for latest SVN red5 tags that build with ANT. Updated for OpenJDK 1.6.0_24 (32bit/64bit). Updated for ANT 1.9.4 . Here is how we installed latest Red5 and JDK on a server with Linux CentOS . These hints can help you install on many linux VPS or Dedicated enviroments. You will need root access to deploy new software on the server. On some dedicated/vps configuration providers only give a regular account that you can use to access root indirectly with su root. Process is more complicated as you have write access with first account only on your home: you need to exchange any files with a tool like WinSCP using that location. We use WinSCP and PuTTy on Windows and muCommander & Terminal on MacOS. Allow required ports (not necessary if already opened): 3690 (svn), 5080, 1935, 1936, 8088. See more details at the end of this tutorial. Or install latest JDK from http://www.oracle.com/technetwork/java/javase/downloads/index.html . You can install latest Java6 JDK (scroll down) or latest (top) depending on applications you plan to use. Use uname -a to see if you need to download a 64 bits version. We got Java SE Development Kit, JDK 6 Update 31. We selected linux multilanguage, right clicked > properties on the jdk-6u31-linux-i586-rpm.bin and downloaded it with wget urlon the server. It downloaded with a big name with parameters (ls to see after download). We use WinSCP so we right clicked, refreshed from there and then renamed the new file that showed up in the root home directory. You can also rename it from shell. Make sure you use mv “old_long_name” new_name for the long name as it uses special characters. Make sure you install JDK and not JRE. Press space or enter to scroll terms and when it asks you type yes and hit enter. If needed confirm Java DB update, yes ENTER. We installed it on multiple servers and had to change some shortcuts on ones that already had an older java, so it runs the new one. Usually if preinstalled it’s located in a java or jdk folder in /usr or /usr/local . Make sure the shortcuts in /usr/local point to the new locations (/usr/local/jdk to /usr/java/jdk1.6.0_14 and /usr/local/jre to /usr/java/jdk1.6.0_14/jre) . Downloaded ant (can be done from any mirror – see http://ant.apache.org/bindownload.cgi), unpacked it, moved it to a good location and added variable, shortcut. If older ANT is preferred get one from http://archive.apache.org/dist/ant/binaries/ . Fix: This time got “Error: Cannot retrieve repository metadata (repomd.xml) for repository: atrpms. Please verify its path and try again” . Solution: yum –disablerepo=atrpms install subversion . If latest trunk has bugs or does not work fine with your required software you can download other versions from http://red5.googlecode.com/svn/java/server/tags/ . Then rename old red5 (backup). The > start.log is to have it output the logs in the file and & is to keep it running in the background. This should report a long line with java and many options and this command. Check start.log if it failed to start. If 1935 shows up and 5080 doesn’t it probably means web server is not running. On latest versions Red5 no longer includes tomcat. See Red5 JEE Container Plugins for details. You will need to overwrite conf/jee-container.xml with one extracted from plugin jar and create a plugins/ folder with multiple jars (get this from older red5 distributions). Then you can use service red5 start|stop|restart . Make sure your run it from the right folder. The one in /opt/red5 will not work – you must run it from /opt/red5/dist/ . When Red5 is running you should be able to access http://your-server-domain-or-ip:5080/ . If it works first thing go to http://your-server:5080/installer/and install admin. Then to http://your-server:5080/admin/register.html and register an username and password. Then you can check application statistics anytime from http://your-server:5080/admin/ with server ip and the registered username, password. Restart Red5 anytime you update files in the /opt/red5/dist/webapps folder – where all applications should be installed. Usually these should work and should be used each time you add a new application. We also noticed that red-shutdown.sh sometimes does not close it down to allow restart when webapps are added or updated. This usually occurs when red5 freezes becasue it encounters errors like running out of memory. So we run ps aux | grep red5 to see process id (first number: PID) and then run kill process id if it’s still alive. On some systems root cannot bind ports above the early 1000’s so red5 must be run from another account. Sometimes ports need to be configured in a hardware firewall. Contact server provider / administrator for more details about enabling ports. This info provided by a host could also be helpful. Please be advised that custom iptables rules should be placed in the directory listed below. 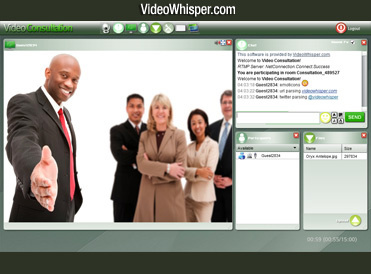 This was done for the installation of VideoWhisper applications. 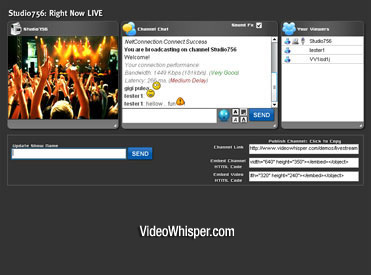 To do that just download the latest videowhisper rtmp application, unzip it on your computer and copy the videowhisper folder and all its contents to/opt/red5/dist/webapps . As verification, check that you have a /opt/red5/dist/webapps/videowhisper/WEB-INF/ folder on your server. After copying/updating this, restart the Red5 server (as explained above) and you can install the videowhisper video conferencing / live streaming scrips to use the new rtmp application. The Red5 VideoWhisper RTMP Application has some cool settings, like enabling access with external players / archiving of all video streams as flv files / limiting access to certain domains / setting absolute paths for live streams and recordings to be able to share videos with other applications (i.e. video sharing). Edit all these in WEB-INF/red5-web.properties and restart the Red5 server. If we forgot to mention something here, or you have any questions about this submit your inquiries on Video Whisper Contact Page or comment below. An alternative to doing the red5 installation yourself would be to order red5 installation . If you don’t have the time and experience to run your own server or vps, you should use managed red5 hosting .